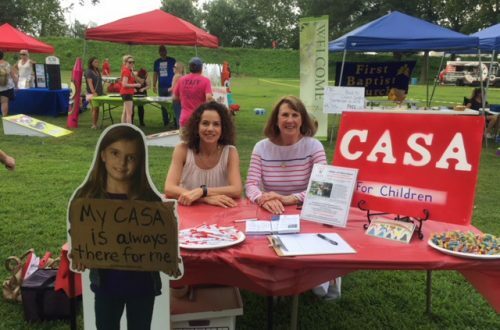 In a strong showing of support for safe kids and safe communities, CASA for Children of Mercer and Burlington Counties mobilized volunteers, staff and trustees to participate in the 2018 National Night Out across 19 towns on August 6 & 7. 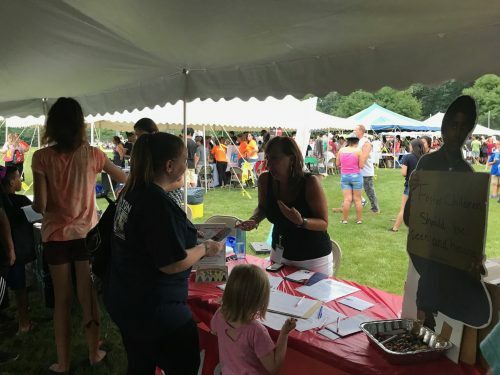 The annual event, organized by police departments on the first Tuesday of August, offer CASA a chance to connect with thousands of neighbors in a single evening to recruit more volunteers to speak up in family court on behalf of children who have been removed from their homes because of abuse and neglect. This marked the first year that CASA launched the outreach event on a large scale. Close to 40 volunteers – armed with brochures, clipboards, colorfully painted signs and large cut-out “cardboard kids” – shared their passion and commitment for an organization that depends on hundreds of volunteers who provide consistency for children languishing in the family court system. The concept of getting out a “Call for Volunteers” germinated from a meeting with Senator Troy Singleton, who represents the Seventh Legislative District in the New Jersey Senate and his introduction to the Burlington Police Chiefs Association. “We appreciate the wonderful introduction to the Police Chiefs Association from Senator Singleton. We look forward to strengthening our partnerships with our police departments across Burlington and Mercer Counties and our involvement in National Night Out is a great beginning. CASA also has many dedicated advocates who are retired police officers and we are looking to grow these numbers this year.” stated Katherine Carmichael, Executive Director, CASA for Children of Mercer and Burlington Counties. Hamilton, Hightstown, Lawrence Township, Princeton, Robbinsville, and West Windsor. 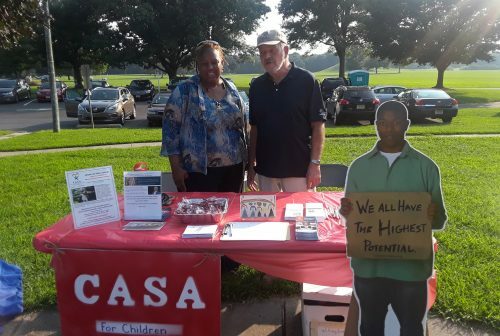 CASA reached across the border to also participate at National Night Out in Morrisville, PA.
See our National Night Out Gallery for more photos.